When contact grills first came out, I didn't rush out to get one. Hard to believe, right? But it never seemed like something I needed. And I've always been skeptical of their cooking prowess. 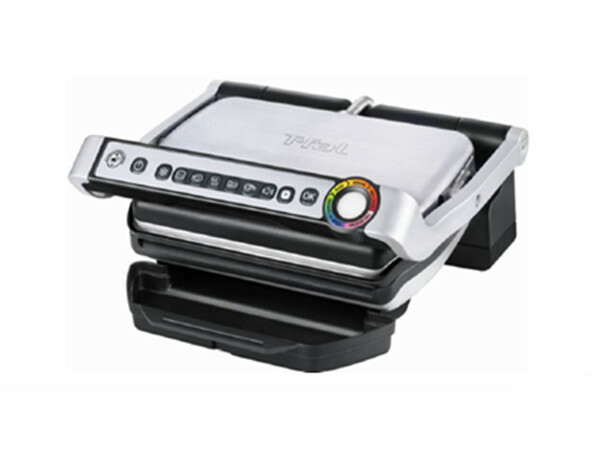 But that doesn't mean I'm not willing to test one, so I gave the T-fal Optigrill ($179.99) a run through its paces. Unfortunately, the unit I received didn't include the instruction manual. Fortunately, it was simple to operate, even without instructions. Which is always a plus, because those little booklets are so easy to lose. The idea is that you choose the item you want to cook from a picture menu on handle of the grill - the pictures indicated burgers, poultry, sandwiches, sausages, steak-like meat, and fish, along with a defrost setting and a manual option. A large light that changed color indicated preheating, followed by different donenesses for the chosen item. As the indicator changed from one doneness level to the next, the unit also beeped. I tested it with some fish filets, and it did a good job of cooking them through without drying them out, and there were nice enough grill marks where the uneven filets made contact with the grill surface. Next, I tried a rather thick steak and removed it when the pretty light told me it was medium rare. I was actually surprised that it got the cooking temperature correct. The grill marks were impressive, too. I wondered if it would have the same luck with a thinner steak, so I went to the other extreme with a flank steak. It still managed to cook it to the right temperature which was even more surprising, since a thin steak like that can go from undercooked to overcooked in such a short time. Next, I tried a sandwich loaded with meat and cheese and it handled that just as well. To be perfectly honest, I'm still not sold on the idea of cooking a steak on any contact grill - I prefer a grill or screaming hot cast iron pan - but I know plenty of people who use their contact grills for pretty much everything except soup. And of course there are plenty of things to cook besides steak. The big benefit to this particular grill is that it senses the doneness, so it's perfect for that relative of yours who always overcooks everything. That relative would still have to listen for the beeps and pay attention to the color of the light, and take the food out when it's finished cooking, so it's not totally foolproof. But it would definitely help cooks who tend to overcook or overcook everything or who don't know how to gauge the doneness of different types of foods. And I'll admit that it was kind of nice to put a sandwich in there and just listen for beeps instead of checking over and over to see if the cheese was melted.